What are the words we use to describe something that we never thought we’d have to describe? In Seven American Deaths and Disasters , Kenneth Goldsmith transcribes historic radio and television reports of national tragedies as they unfurl, revealing an extraordinarily rich linguistic panorama of passionate description. Taking its title from the series of Andy Warhol paintings by the same name, Goldsmith recasts the mundane as the iconic, creating a series of prose poems that encapsulate seven pivotal moments in recent American history: the John F. Kennedy, Robert F. Kennedy, and John Lennon assassinations, the space shuttle Challenger disaster, the Columbine shootings, 9/11, and the death of Michael Jackson. While we’ve become accustomed to watching endless reruns of these tragic spectacles—often to the point of cliché—once rendered in text, they become unfamiliar, and revealing new dimensions emerge. Impartial reportage is revealed to be laced with subjectivity, bias, mystery, second-guessing, and, in many cases, white-knuckled fear. Part nostalgia, part myth, these words render pivotal moments in American history through the communal lens of media. I’ve been wanting to read this for awhile (okay ever since I saw the author being interviewed by Stephen Colbert) and I’m so glad I finally picked this up! Basically the premise of this is in the very title itself. 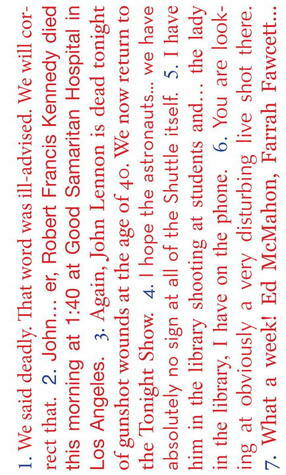 Kenneth Goldsmith transcribed various radio stations, news reports, etc. of seven american deaths and disasters as they were happening. As someone who has only lived through three of these (and can only remember two) it was such a spell-bind experience. And an extremely educational one too I’d say. To me there is something weirdly fascinating about hearing about deaths and disasters. For example, as Kenneth Goldsmith transcribed various figureheads talking about September 11th, 2001 as it happened, I’ll never forget my (vague though they are) memories of what happened to me personally on that day and how I found out about the attacks. I think that’s what makes this so beautiful is anyone who reads this can go through a kind of horrific nostalgia of where they were when these events happened, while also learning about the events from a different standpoint. It’s really fascinating. The way Kenneth Goldsmith transcribed everything also throws you into the time period and makes you feel as if you’re living the events as they are happening. This is really a spectacular novel and I highly recommend it for any age groups since many people will be able to appreciate and relate to it in so many different ways. And it’s a fairly quick read as well! I was simply transcribing what lay before me. The cliché was working its magic, flipping back and forth between the insanely meaningful and the dreadfully inane.